Paddling is a popular pastime in Australia. But, just because you’ve been doing it for a long time doesn’t mean you can do away with safety. 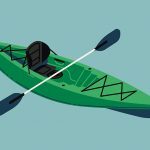 Whether you’re using a kayak or canoe, there are specific safety items for paddlers that you can’t do without. Below, you’ll find a list of indispensable water safety items for every paddling aficionado. 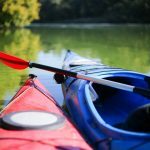 Food and water are critical to survival, so it only makes sense that these are included in this list of items for safe paddling. Some may want to leave these behind because they only intend to go paddling for a short time, but dehydration and hunger are serious discomforts that can impede your trip. You can even get light-headed or dizzy if you go on for too long without food or water. Preparation is the enemy of incidence. For the same reason you’ll need water, sunscreen and sunglasses are also a must. The sun’s rays can be distracting and harmful. Sunscreen minimises the risk of sunburn, while sunglasses protect your eyes from the UV rays. See to it that your sunscreen is resistant to water and doesn’t sweat off. It must also be long-lasting. This way, you don’t have to keep re-applying every half hour. Headgear is very important for every kayak or canoe enthusiast. Consider the type of paddling you’ll be doing. Is it a leisurely stroll through a quiet lake? Or, is it a turbulent journey through a rapid river? Hats are recommended for general kayaking or canoeing. However, the proper headgear for whitewater paddling is a helmet. If you’re paddling through a rocky area, it’s best to go for the helmet option as well. This protects you from head injuries in case you hit your head on something. Every paddler must wear a life jacket. It’s as simple as that. Even if you’re an expert swimmer, life jackets ensure that you don’t drown. When you’re unconscious, your swimming skills won’t do you any good, but your life jacket will keep you safe. You also can’t swim for long periods of time, so let your life jacket do all the work and save your energy. Life jackets are one of the paramount safety items for paddlers. When you find yourself in a predicament, paddling whistles can alert other people that you require assistance. You can shout all you want, but the chances are slim that anyone’s going to hear your cries. Invest in a paddling whistle. They’re cheap and easy to carry around. Once you’ve bought one, it’s a smart idea to tie it to your life jacket. These are plenty of uses for a rope throw bag when you’re out paddling. They’re generally used to rescue a swimmer in need of help. Simply throw it at the target and pull them to safety after they’ve grabbed onto it. You can also use the rope to tow another watercraft. It’s also a good idea to have a knife with you if you need to cut the rope for any reason. Just be careful with sharp objects! Always bring a first-aid kit with you. Hopefully, you won’t need it, but it’s better to be safe than sorry. It can also be a literal lifesaver if anyone gets injured. 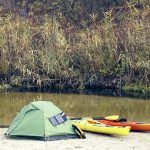 It may not necessarily be for you, but you can help other paddlers who forget their own kits at home. Make sure your first-aid kit is properly stocked with all the medical items you need. An empty kit won’t be of any use. 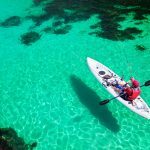 Take your mobile phone with you when you go paddling. Though most phones are water-resistant nowadays, you can always store it in a dry bag for added protection. Having your phone with you ensures that you’ll be one call away from help should you need it. If you’re going paddling where there’s little to no phone reception, bring a two-way radio with you. Getting lost is a serious dilemma, especially when you’re way out in the water. If it happens to you, make sure you have your navigational tool ready. It can be a map or a compass, depending on the situation. To be extra safe, bring them both! 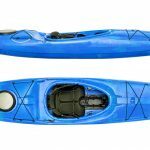 These safety items for paddler will ensure a fun and safe paddling adventure. Don’t even consider getting in your kayak or canoe without them. Even if you’re going to a place you’re already familiar with, bad things can happen. No one can predict the future, so it’s best to be a safe paddler at all times. 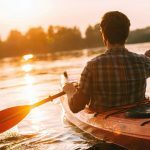 Enjoy your kayak and canoe padding as much as me with these safety items on you. I there anything else you can add to this article?